So you’re an auto enthusiast - but you happened to miss out on this year’s Auto Enthusiast Day? Well buckle up, because this recap contains fast cars and good times. KEENDESIGN was front and center at this event, and the blazing summer heat wasn’t the only thing that was burning the pavement. Rubber was set ablaze during the event’s incredible drifting demonstrations, where professional drifters such as Matt Powers, Chelsea DeNofea, and Vaughn Gittin Jr. wowed the crowd with their pavement-punishing beasts. Crazy-engineered and astonishing builds of all disciplines were on display across multiple vendors, with photographers eager to get that perfect shot. 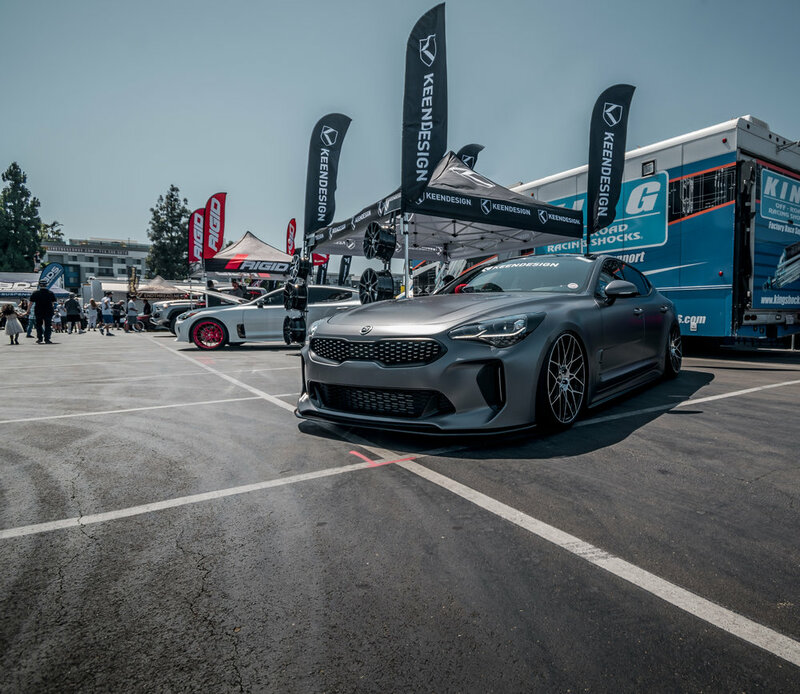 As the event founder and hosts, the team at Nitto Tire emphasized the importance and performance impact that a quality set of wheels and tires can have on your vehicle, which they (properly, of course) demonstrated by shredding some more tires at the track of Angel Stadium. The passionate drifters at this event impressed the crowd, creating a lively atmosphere for all to enjoy. Little did they know, our team in the KEENDESIGN booth just around the corner had just that-quality-built, specially engineered wheels meant not only to be durable, but to increase performance without sacrificing the aesthetics of your vehicle. Although we offer many different wheel designs and finishes, we were especially thrilled to showcase our exclusively engineered 20” KD07 wheels on not one, but TWO remarkable Kia Stingers. Our first Stinger on display, owned by Alexandra Palencia, featured a set of aggressive, 20” KD07 wheels in a Custom Red Finish. When paired with the brilliant pearlescent white paint finish of the Stinger itself, it created arguably one of the most timeless and attractive color combos of all time. Sitting flush to the pavement beside it was KEENDESIGN’s very own Kia Stinger GT, sporting our flagship KD07 20” wheels in Machined Black. The deep, rich black of the inner spokes complimented the cool, bright visage that the machined aluminum created on the outer spokes, accentuating the aggressive, crisp lines of the sport sedan’s KEENDESIGN by SPREEK carbon fiber front lip, side skirts, and trunk spoiler (more carbon fiber aero pieces for the Kia Stinger coming soon - stay tuned). Check out what Stance Works has to say in his AED article here! It may have been a scorching hot summer day, but we were surprised and honored by how many of you fought the heat to come say hi and chat cars with us! We saw many familiar faces, and saw many new ones! We appreciate your attendance to the event and support for the KEENDESIGN brand! Still yearning to get some photos of these unique KDM beauties but haven’t had the opportunity to yet? Follow us on our social media below, join our newsletter, and never miss out on our future events, product showcases, and giveaways!